Hey! Look over here! There's a celebrity feud to gawk at! I'll pause while your eyes grow to the size of saucers and you turn to your coworkers with a Joker-esque grin. That's what we do each time we hear of two celebs who are ready to rumble, but the problem is, things aren't always so dire. Take, for example, the fact that new artist Lorde's comments about Selena Gomez's "Come and Get It" have her in hot water, just for defending her opinion that the song doesn't send a good feminist message. Both Lorde and Gomez have responded to media inquiries with calm statements, but that's not the way their loudest fans and critics have read this interaction. The story goes a little something like this: Lorde commented on Gomez's hit song, which includes lyrics like "You ain't gotta worry, it's an open invitation/ I'll be sittin' right here, real patient" and professes that the woman in the song is sitting on ice, just waiting to be sexed up by the manly man in question. 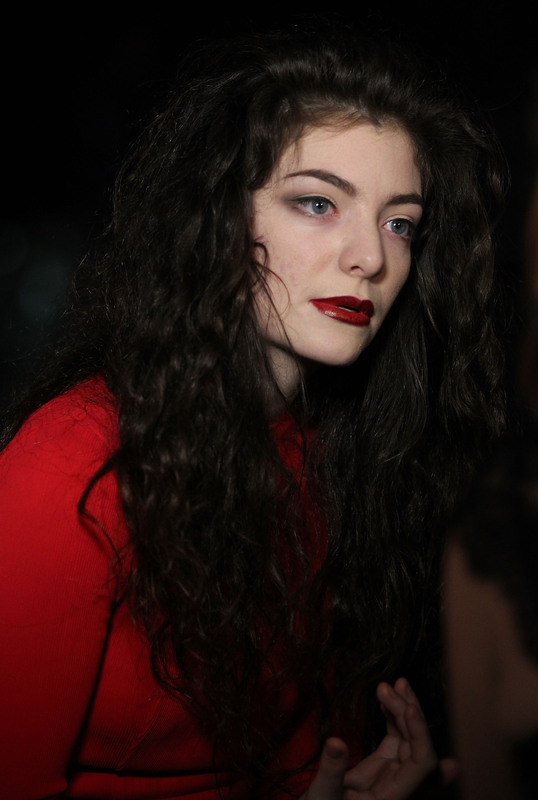 Lorde said that as a feminist, she takes issue with this portrayal of women. Validity of that statement aside, the 16-year-old singer is simply speaking her mind about the representation of women in pop music. She's not "dissing" Gomez as Rolling Stone posed the comment. She's a smart young woman who's speaking her mind regarding the state of a genre she's very much a part of. But, no, this was a Grade A celebrity diss heard 'round the world. There’s two different kinds of criticism. There’s the people that hide behind a computer and want to say endless amount of things but never say it to your face, and then obviously there are the vocal ones. I appreciate everybody’s opinion, especially because I’ve covered her music lots of times. I think she is super talented and I think it’s awesome. But I think at the same time that feminism and that specific thing is very sensitive because in my opinion it’s not feminism if you’re tearing down another artist. So that’s the only thing that I feel but you know, she’s young, she’s got so much talent, she’s gonna take over, she gets it, so I don’t take it to heart. Sure, Gomez's response is critical of Lorde, questioning her ability to be a feminist and criticize other artists — which is not, in fact, the definition of feminism — but Gomez ultimately ends it with praise for the young singer. It's a very specific message: Yeah, I'm not happy about hearing Lorde's comment, but let's all hold hands and be successful pop stars singing a dubstep remix of "Kumbayah" together. But the media says, Nope! Fight to the death! Finish her. I think there's a funny culture in music that's only happened over the last 15 years, and that is haters. That if you have an opinion about something in music which isn't 100-percent good, you're a hater, even if you have perfectly reasonable grounds for that critique. This comment came out on Oct. 7, yet we're still proliferating the "diss" culture that refuses to stop engulfing any famous young woman with a voice. It's a disgusting display of our voracious desire to pit any two stars against each other and yell "fight," the same way we'd command a pair of Barbie dolls to kiss when we were younger, sweeter people. Did we not get enough of this when Miley Cyrus and Sinead O'Connor were tearing each other to pieces — you know, that actual public fight that clouded our brains and hurt our ability to participate in high-minded discourse? Apparently not. If anything, Miley vs. Sinead has just escalated our need to find another celebrity fight; this Selena-Lorde interaction is ancient by celebrity news standards, yet here it is, popping its head in and begging us to pick a side to make indignant remarks about. I suggest we collectively refuse. Let's call shenanigans and find the real value in all this media attention: Lorde, at 16 years old, has decided this cycle of insanity doesn't matter, and she's instead chosen to simply speak her mind. She's simply continuing to be the young woman we fell in love with the first time we heard "Royals," her hit song that questions our obsession with rich living and celebrity status. So, goodbye "celebrity feud." Farewell, "Lorde's huge diss." Hello, one smart young woman who's ready and willing to use her brain to express valid opinions about the realm of pop music in which she's chosen to take up residence. And bonjour to the hope that she might actually incite some change in that tide.